“Utilising existing electrified railway lines within a 30-kilometre radius from the city centre and operating diesel-electric multiple units (DEMUs) constitute CRS,” ... each DEMU can have five to 10 coaches and can operate at speeds of 75 kmph. “Operating DEMUs can reduce 25 percent of traffic,” Sreehari said. 25% reduction in traffic!! Assuming the numbers have backing, what more do we need to convince Yeddy and gang to go chase SWR with CRS proposals? Enough is enough. time to take up the subject of commuter rail service for Bangalore. CTTP talks about it (see 7.5 - CRS). 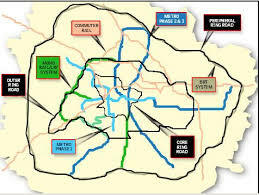 Masterplan-2015 has a proposal of utilizing 62 km track on making the commuter service possible in two phases (2007-2012, 2013-2018, each estimated at Rs 325 Cr) at total cost of Rs 650 crores. Things might have been easier if same party ruled at center and state, but we got to try. Now, on to thoughts about how this could be done, that is - implementing CRS. Lets talk the analogy of Ring roads, Outer or peripheral. The objective is to keep traffic going through the city (trucks) from coming in to the city. right? Now, do SWR goods trains enter our city? Answer would be yes. Don't have stats, but let us assume that 50% SWR's capacity in the city is consumed by non-passenger services. Given city's dynamics today, is this fair use of "land" held by them? Do I hear a no. Next, take the analogy of Inland container depot at Whitefield, or the new Airport at Devanahalli. The idea behind both is to move or keep congested areas outside the central city. Can the state government build two or three state of the art stations for southwestern railway, and in turn acquire or lease some capacity on SWR's assets inside the city? Don't give us examples of Mumbai Central and VT stations. Both the stations handle long distance as well as commuter traffic. Long distance trains could all start from these new	stations, we are talking places even beyond Yeswantpur, KR Puram and Nynadahalli. State and SWR build tracks analogous to Peripheral Ring Road to keep through traffic away. 40%-50% capacity of SWR's assets inside the city are utilized and enhanced to build CRS. This could be a new public entity with GoK and SWR having equal stakes in it, or a PPP (a historic first for railways), or something that could integrate with BMRCL (Metro rail corporation). Use trains to come in to the city from Nelamangala or Bidadi. No rush to catch them, you would get one every 9-10 minutes. Perhaps the airport trip too gets covered in here. Cantonment to Devanahalli in 50 minutes. Important trains (Rajdhani, Shatabdi), or local haul trains of SWR (Chennai, Hubli day runs) could leave from central city stations. SWR can run their container business in the city as well. But they will have to restrict themselves to the capacity agreed upon with them. Wish we had better stats, the ranking itself doesn't tell the full story. 25% reduction in congestion is something that keeps our trees intact, reduces fossil fuel usage, and helps our city spread right and not just get crowded in the center. Those who want to take this up, please join in. We will chase and meet the three concerned parties - SWR, state government, and Railway ministry to at least hear their take on CRS. Its not that nothing is planned on this front. As mentioned above, Masterplan-2015 has a proposal on CRS. We just have to follow up on these proposals by reaching the right people. On to some specific maps now. We will build these as we talk. Tarle, Vasanth, Sandeep, all CRS enthusiasts, please help. Have been trying to call him to get an apptmt with SWR GM or anyone higher. I will work on a meeting with SWR. Can someone work on arranging a meeting/chat with RITES - those who prepared CTTP and suggested CRS. Will need to meet Mr M N Srihari as well. So 3 meetings to start with. Need not be physical meetings. Can do teleconference as well. Sometime back, I read in a interview with Shankar Bidari in "The Hindu" that the former was in favour of decongesting and decentralising the Majestic Bus Terminal and the Bangalore City Junction Railway Station. He did evince support to develop different edge stations to ease congestion in the city centre. Already a few trains both originate and terminate from the Yeshwanthpur Railway Station. The Railway Authorities are developing Cantonment Railway Station on the same lines as that of the Yeshwanthpur station. Click on it and you go to a search site possibly specializing in dating :) What fun. It could be a simple case of someone at Railways forgetting to renew registration for irsuggestions.org website. Just thought I'd share. Meanwhile, I am trying other ways to reach them (See Gautam's other thread). No response yet from SWR PR officer though. cadambi - Cantonment and edge? Even Yeswantpur is not edge, but I think it has enough space, and good access (to Tumkur Road, not far from ORR) to be developed as a station shared for commuter as well as passenger rails. No response yet from the contact email ids of Railway Board or SWR. Either they don't respond to mails from ordinary citizens, or have too much email to handle. Will have to try 'other' means now. Wanted to try the public channels first so that noone tells us we didn't try those. Anyone has contacts, please PM me. I remember someone here said that an SWR higher-up guy lives in his neigbourhood.